21 October 2014, at 10:52a.m. 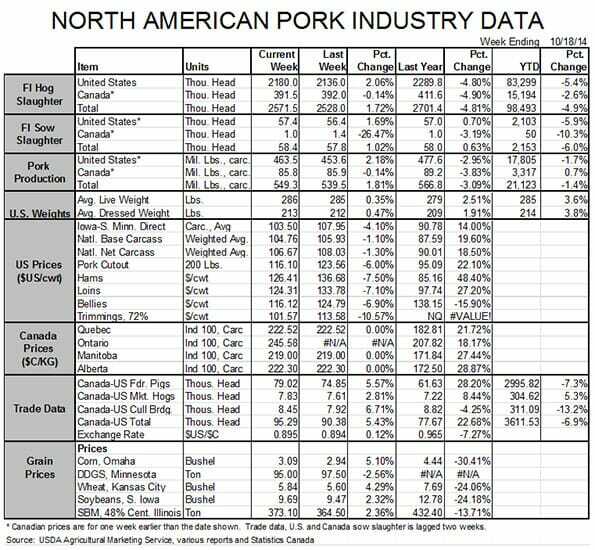 US - To see Lean Hogs futures prices fall in October is not an unusual occurrence. To see them fall $5.75 in two days without any real critical market development is another thing entirely, writes Steve Meyer For the National Hog Farmer. I’m not real sure exactly what happened but there are a few “usual suspects” that likely played a role.First, equity markets have taken a beating lately with the Dow giving back all of its 2014 gains. Is it a “correction” or the end of the bull market? Will turmoil in the Middle East (now there’s a news item, right?). Ebola, continued economic weakness in Europe, etc., etc., etc. push the world back into recession? What would a slowing economy do to commodities? How could the Fed even respond given that they haven’t unwound their last response yet? All of those denote risk and every now and then that risk visits itself upon commodities. If that is the case here, $5.75 is probably a small hit. Second, prices were high! The counter-seasonal rally for pork cuts and hogs had carried Lean Hog futures roughly $10 higher in just three weeks – in August and September! I don’t think a big break was necessarily inevitable but it was certainly no surprise, especially in this year of wild, often unjustifiable price swings. It’s been a banner year for volatility and what evidence is available to suggest it is over? Third, there was a rash of stories about how porcine epidemic diarrhea virus (PEDV) will be less severe and hog supplies will be higher. I can’t fault either of those viewpoints since I share them. But the stories seemed to have “Don’t Worry, Be Happy” playing in the background. I believe hardly any of what we now know about PEDV would warrant any feelings quite so good. Pharrell Williams might be happy but, regardless of what kind of hat he wears, he isn’t the poster boy for PEDV yet. The situation is indeed better. As can be seen in Figure 1, the number of case accessions has been pretty stable in the range of 50 to 70 per week since late-August. The University of Minnesota has reported new sow herd breaks in only two of the past 16 weeks (three total sow farms) among the 19 large systems (739 total sow farms and 2.084 million total sows) that it surveys. 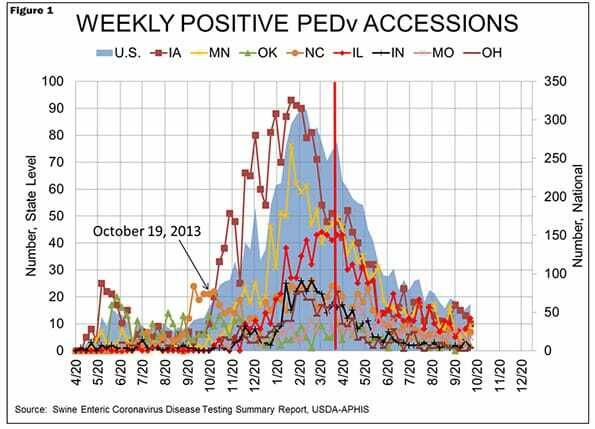 The number of weaned pig case accessions (the numbers I used to compute pig losses from March through August) dropped to its lowest level (44) since one year ago (39) in September. Producers and veterinarians both know far more than they did one year ago about this disease and biosecurity practices have improved markedly. The new vaccines may not be great for protecting naïve animals but they do boost antibody production in sows that have been exposed and thus carry the promise of reducing pre-weaning mortality. How much difference will we see this winter? That is the question and traders seemed to take last week’s stories to mean everything was going to be back to normal. In fact, it appears to me that the futures market has priced a PEDV solution into prices for next summer and fall. The veterinarians I’ve spoken with don’t think it will be that easy. The cold days of November and December are just around the corner and we’ll see just how effective all of these measures will be in controlling PEDV when the conditions for its survival outside of a host improve. 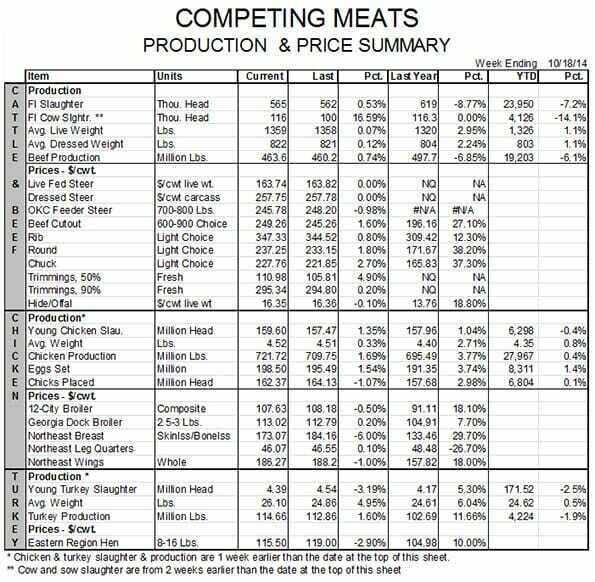 Futures markets for next year are offering very good hog margins at present. The only year in history in which producers have averaged higher than the $42/head current in my model is this year. You should find it very difficult to say no to those kinds of margins. The risk of not having the pigs is an understandable and legitimate reason to do so. So is the fact that your balance sheet is probably in pretty good shape after this remarkable 2014. Don’t let those reasons deter you completely. “Hedge part of them and hope you are wrong” was Professor Glenn Grimes’ admonition when margins looked good. I think hog supplies could be lower and thus prices be higher than the futures market apparently expects, but the good professor’s instructions, it appears to me, apply now quite well.